Canal side home that can accommodate your next family gathering. Canal & Boating: The Cast-Away Villa is a canal front property connected directly to the Gulf of Mexico. This area is known for its incredible fishing opportunities and with Cast-Away Villa's private dock, you have the ability to bring your own boat or rent one during your stay, making this home the ultimate fishing accommodations. A fish cleaning station and nighttime underwater light are provided as well as well as a 13-foot 2-person kayak and 2 paddleboards, along with applicable paddles. Life jackets must be supplied by renter. Outdoor Living: Defined by the prominent palm trees, which frame this beautiful outdoor space, the two levels of both sun-drenched decking and shaded patio provide seating and entertaining space to please everyone you are traveling with. A charcoal grill is provided. Plus, the Tiki Bar space, on the semi-covered patio, will transport you to French Polynesia. This outside bar is fully equipped, minus drink ingredients. Great Room: Wide open spaces with mixed touches of the tropics and Texas coast lend to the laid-back atmosphere of this large and inviting space. From the river rock fireplace (available November - February) and leather furniture to delightful decorations at every turn, this room is 360 degrees of enjoyably useful space. Cast-Away Villa's Great Room boasts the following amenities: Open concept design; Flat screen television (cable and DVD player with limited assortment of DVD movies); Leather couch and loveseat; Huge desk with room for two workstations; River rock fireplace (switch activated during winter months only); 2 ceiling fans; Reading material for various ages and interests; Games - card and board games. Bathrooms: Cast-Away Villa has 3 bathrooms. Bora Bora Master Bath (Second Floor) - Pictures of palm trees, secluded ocean vistas, and the white sandy beaches give this bath the feel of French Polynesia. Bath is furnished with two pedestal sinks, 2 vanities, toilet, shower, and 100% luxury cotton towels. Seashell Main Bath (Second Floor) - Shells and seagulls showcased in relaxing muted colors draw you into the tranquility of this space. Bath is furnished with 2 pedestal sinks, a bathtub with shower, toilet, and 100% luxury cotton towels. Ocean Bath (First Floor) Nautical and fish inspired, this room is decorated with reminders of the ocean. Bath is furnished with 1 pedestal sink, 1 vanity, toilet, shower, and 100% luxury cotton towels. All bathrooms are equipped with a hairdryer as well as all natural liquid hand soap, shampoo, conditioner, and bar soap. Laundry & Cleaning: Cast-Away Villa is equipped with a full-size washer and dryer as well as an ironing board and iron. This home is cleaned with all natural cleaning products and our linens are professionally laundered with unscented soaps. For your convenience, we also make available, for use during your stay, all natural dish soap, and laundry soap. Cleaning fee is $200 per stay (plus tax) and covers up to 6 hours of cleaning time. Any additional cleaning over and above 6 hours will be billed to the renter at $50/hour. Directions: Cast-Away Villa is located in City by the Sea, TX, a quiet canal community located directly between Rockport, TX and Port Aransas, TX. If you are driving, the driving distance from Austin - 3.25 hours; Houston - 3 hours; San Antonio - 2.25 hours. If flying in, the house is a 40-minute drive from the Corpus Christi International Airport. Parking: Driveway has room to accommodate 6 vehicles in off-street parking. Boat trailers are allowed. Pet Policy: Dogs will be considered on an individual basis and there is a 2 dog maximum. A pet fee of $60 per animals is charged per stay. To inquire further about renting this home with a pet, please contact owners as additional pet care policies are part of our rental contract agreement. MAXIMUM OCCUPANCY of 15 people is firm. We cannot accommodate more than 15 due to the house being on a septic system. Only 12 of these guests can be adults per our neighborhood rules. No exceptions will be made. Taxes: A tax rate of 15% is the required occupancy tax and is added to our rates, cleaning, and pet fees per state and local laws. Our family loves to travel and we have been vacation home renters for many years, ranging from rentals as far north as Duluth, MN, as far south as St. John, USVI and as far east as Rome, Italy. We have built into this home everything we have loved about our favorite rental homes over the years. We hope that our dedication to detail will make your stay as enjoyable and full of wonderful family memories our past trips to vacation rental destinations. It has always been our dream to own a home close to the ocean. Growing up land-locked in North Dakota and Minnesota it seemed like a distant dream for many years, but now we are so excited to be on the ocean, which means being just a step away from a kayak or paddleboard adventure. Cast-Away Villa itself is decorated with room themes that remind our family of some of our favorite travel destinations. So, whether you have visited the Caribbean or Bora Bora yourself, we hope these rooms add the feel of those destinations to the already wonderful spaces you experience in touring around the Rockport and Port Aransas area. If you are looking to get away from it all, this home's location in a small and quiet canal community will be a perfect fit. Proximity to Rockport, Port Aransas, and Corpus Christi allows renters the ability to take advantage of all the tourist attractions they desire, while at the same time have the ability to relax get away from it all. All bathrooms are equipped with a hair dryer, 100% luxury cotton towels as well as all natural liquid hand soap, shampoo, conditioner, and bar soap. Back yard has direct canal access and boat tie up space for guest use. Dual-Zone Central Air. Forced air. All linens are 100% cotton and laundered with all natural laundry soap. Full size washer provided as well as all natural laundry tablets. Gas fireplace (Nov - Feb). Internet code is provided for guests at time of check in. Wifi reaches all areas of the home. All towels are 100% luxury cotton and laundered with all natural laundry soap. Amenities: fireplace, 2 flat screen televisions (cable & DVD player), leather seating, huge desk, ceiling fans, vaulted ceilings, open concept design with kitchen & dining, and view of the water. All natural dishwasher tablets are provided. Organic spices, teas, plastic wrap, foil, and plastic bags are all provided. Service for 12 with main set of dishes and plus additional plates, glasses, and silverware provided for over 20 service sets. Inside counter seats 3, inside table seats 6 but expands to seat 12, and outside table on upper deck seats 6 plus outside table on patio seats an additional 4. Reading material for various ages and interests provided. Board games and card games are stored in the pantry as well as in the coffee table chest. Limited selection of PlayStation games stored in Beach Room. Lush palm trees fill this yard plus also boasts a fenced backyard with grassy lawn plus small lawn in front. The first floor rooms (2) and a 3/4 bath are accessible without stairs, but not to fit the width of a wheelchair. Also, the main living area and outside entertainment area require guests to navigate stairs to access. Great house. Great sitting area next to the water. Well furnished kitchen for the great meals we had. Good times. Our family enjoyed the spacious home where there was plenty of room to gather together in the family area to play games or go to their own space to have personal time alone. The beds were very comfortable. The kitchen was great for cooking for our large group. The spacious deck and back patio area were quite and relaxing. There were repairs going on all around from the hurricane, but terribly loud nor distracting. We all enjoyed the paddle boards and kayak in the canal and bay area. We got to see dolphin within 10 yards of our kayaks. The nearby beaches were fun for the kids to get their fix for the waves and sand as well as shell searching for the adults. We are so glad you enjoyed staying at our home and your family was able to enjoy the natural beauty we have in the area as well as witness how determined the residents are in getting things restored from hurricane Harvey. Yes, the dolphins have been very active this year near our canal. Glad you were able to see them so close. We had a great time at this beautiful home. We had 10 adults and 7 kids (2 babies)...and were able to accommodate everyone. My only feedback would be that all of the doors in the house are louvered doors, so not a lot of privacy or noise control if you have babies/kids trying to sleep. Other than that we loved it! Thanks so much for the review! We're so glad you enjoyed your stay. Thank you, too, for the feedback regarding the doors. We fully understand that in certain situations it's not everyone's cup of tea, but we do love the beach charm the louvered doors add to the space. We hope to host you again sometime! Just pack a swim suit! We loved all the conveniences of a home away from home. All of the provided little conveniences of Home from shampoo and conditioner to laundry detergent and plenty towels! We thoroughly enjoyed our stay and loved being right on the canal with our boat! Our only suggestion would be to add a ladder to easily get in and out of the canal. Thanks again for a great weekend getaway! Thanks so much for the great review, Sherrie. We loved having your group stay and would welcome you back anytime! Very nice well kept home. Really enjoyed our stay! In fact already made reservations to stay again! We so enjoy having you, Ron. We would love to have you again anytime. Great property for large groups. The management company was fantastic and really made our stay awesome! 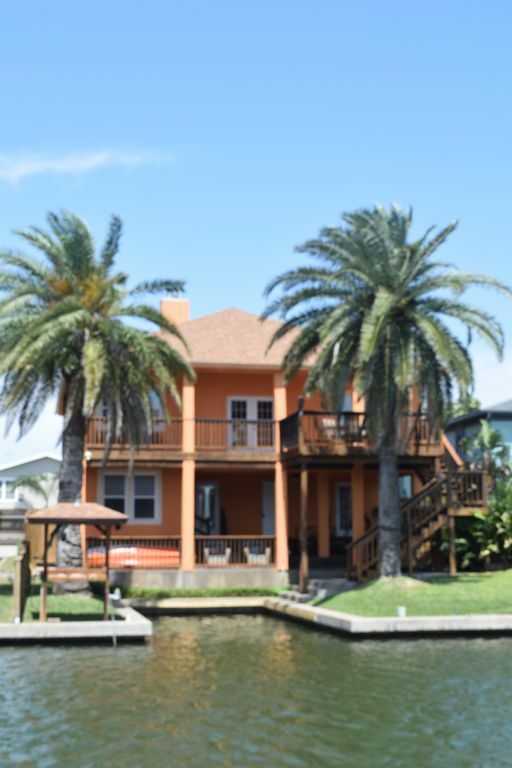 Cast-Away Villa is located in City by the Sea, TX, a quiet canal community located directly between Rockport, TX and Port Aransas, TX.